Professor Noam Chomsky is an Institute Professor and Professor (Emeritus) in the Department of Linguistics & Philosophy at Massachusetts Institute of Technology (MIT). He was educated at the University of Philadelphia and at Harvard University as a Harvard Junior Fellow. He earned his PhD in Linguistics from the University of Philadelphia in 1955. He has spent the 57 years since then teaching at MIT. In addition to his academic work in linguistics, Professor Chomsky has been a noted political activist and philosopher, gaining national recognition in 1967 over his opposition to the Vietnam War and since then has regularly spoken out against US foreign and domestic policies and mainstream American mass media. Between his academic career and his work as a political activist and dissident, he has published over 100 books. Here with Eric Bailey and on the eve of the 2012 US presidential election, he discusses America’s human rights record under the administration of President Obama and the military intervention policies that have seen increased use during the Arab Spring. 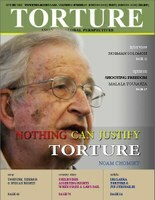 Prof. Chomsky recently communicated with Eric Bailey of Torture Magazine. EB: The US presidential elections are almost upon us and the last four years have seen significant changes in American Federal policy in regards to human rights. One of the few examples of cooperation between the Democratic and Republican Parties over the last four years has been the passing of the National Defense Authorization Act (NDAA) of 2012. This bill has given the United States military the power to arrest American citizens, indefinitely, without charge, trial, or any other form of due process of law and the Obama Administration has and continues to fight a legal battle in Federal Court to prevent that law from being declared unconstitutional. Obama authorized the assassination of three American citizens, including Anwar al-Awlaki and his 16 year old son, admittedly all members of Al Qaeda, – all without judicial review. Additionally, the Guantanamo Bay prison remains open, the Patriot Act has been extended, and the TSA has expanded at breakneck speeds. What is your take on America’s human rights record over the past four years and can you contrast Obama’s policies with those of his predecessor, George W. Bush? NC: Obama’s policies have been approximately the same as Bush’s, though there have been some slight differences, but that’s not a great surprise. The Democrats supported Bush’s policies. There were some objections on mostly partisan grounds, but for the most part, they supported his policies and it’s not surprising that they have continued to do so. In some respects Obama has gone even beyond Bush. The NDAA, which you mentioned, was not initiated by Obama, (when it passed Congress, he said he didn’t approve of it and wouldn’t implement it) but he nevertheless did sign it into law and did not veto it. It was pushed through by hawks, including Joe Lieberman and others. In fact, there hasn’t been that much of a change. The worst part of the NDAA is that it codified – or put into law – what had already been a regular practice. The practices hadn’t been significantly different. The one part that received public attention is what you mentioned, the part that permits the indefinite detention of American citizens, but why permit the indefinite detention of anybody? It’s a gross violation of fundamental human rights and civil law, going all the way back to the Magna Carta in the 13th Century, so it’s a very severe attack on elementary civil rights, both under Bush and under Obama. It’s bipartisan! As for the killings, Obama has sharply increased the global assassination campaign. While it was initiated by Bush, it has expanded under Obama and it has included American citizens, again with bipartisan support and very little criticism other than some minor criticism because it was an American. But then again, why should you have the right to assassinate anybody? For example, suppose Iran was assassinating members of Congress who were calling for an attack on Iran. Would we think that’s fine? That would be much more justified, but of course we’d see that as an act of war. The real question is, why assassinate anyone? The government has made it very clear that the assassinations are personally approved by Obama and the criteria for assassination are very weak. If a group of men are seen somewhere by a drone who are, say, loading something into a truck, and there is some suspicion that maybe they are militants, then it’s fine to kill them and they are regarded as guilty unless, subsequently, they are shown to be innocent. That’s the wording that the United States used and it is such a gross violation of fundamental human rights that you can hardly talk about it. The question of due process actually did arise, since the US does have a constitution and it says that no person shall be deprived of their rights without due process of law – again, this goes back to 13th Century England – so the question arose, “What about due process?” The Obama Justice Department’s Attorney General, Eric Holder, explained that there was due process in these cases because they are discussed first at the Executive Branch. That’s not even a bad joke! The British kings from the 13th Century would have applauded. “Sure, if we talk about it, that’s due process.” And that, again, passed without controversy. In fact, we might ask the same question about the murder of Osama Bin Laden. Notice I use the term “murder”. When heavily armed elite troops capture a suspect, unarmed and defenseless, accompanied by his wives, and then shoot him, kill him, and dump his body into the ocean without an autopsy, that’s shear assassination. Also notice that I said “suspect”. The reason is because of another principle of law, that also goes back to the 13th Century – that a man is presumed innocent until proven guilty. Before that, he’s a suspect. In the case of Osama Bin Laden, the United States had never formally charged him with 9/11 and part of the reason was that they didn’t know that he was responsible. In fact, eight months after 9/11 and after the most intensive inquiry in history, the FBI explained that it suspected that the 9/11 plot was hatched in Afghanistan, (didn’t mention Bin Laden) and was implemented in the United Arab Emirates, Germany, and of course the United States. That’s eight months after the attack and there’s nothing substantive that they’ve learned since then that does more than increase the suspicion. My own assumption is that the suspicion is almost certainly correct, but there’s a big difference between having a very confident belief and showing someone to be guilty. And even if he’s guilty, he was supposed to be apprehended and brought before a court. That’s British and American law going back eight centuries. He’s not supposed to be murdered and have his body dumped without an autopsy, but support for this is very nearly universal. Actually, I wrote one of the few critical articles on it and my article was bitterly condemned by commentators across the spectrum, including the Left, because the assassination was so obviously just, since we suspected him of committing a crime against us. And that tells you something about the significant, I would say, “moral degeneration” running throughout the whole intellectual class. And yes, Obama has continued this and in some respects extended it, but it hardly comes as a surprise. The rot is much deeper than that. EB: It has been just over 10 years since the publication of the Bush Administration’s “Torture Memos”. These memos provided a legal justification for the torture of detainees held by the CIA in connection with the “War on Terror.” The contents of the memos are chilling and have created new debate on torture internationally. Despite all of the promises given by President Obama to close those illegal detention centers, it seems that “black site” activities still occur. What are your views on these detention centers and CIA torture? Also, what do you think about Obama’s promise of CIA reforms in 2008 and how has the reality of his presidency stacked up to those promises? NC: There have been some presidential orders expressing disapproval of the most extreme forms of torture, but Bagram remains open and uninspected. That’s probably the worst in Afghanistan. Guantanamo is still open, but it’s unlikely that serious torture is going on at Guantanamo. There is just too much inspection. There are military lawyers present and evidence regularly coming out so I suspect that that’s not a torture chamber any more, but it still is an illegal detention chamber, and Bagram and who knows how many others are still functioning. Rendition doesn’t seem to be continuing at the level that it did, but it has been until very recently. Rendition is just sending people abroad to be tortured. Actually, that’s barred as well by the Magna Carta – the foundation of Anglo-American law. It’s explicitly barred to send somebody across the seas to be punished and tortured. It’s not just done by the United States, either. It’s done all over Western Europe. Britain has participated in it. Sweden has participated. It’s one of the reasons for a lot of the concerns about extraditing Julian Assange to Sweden. Canada has been implicated as was Ireland, but to Ireland’s credit it was one of the few places where there was mass popular protests against allowing the Shannon Airport to be used for CIA rendition. In most countries there has been very little protest or not a word. I don’t know of any recent cases so maybe that policy is no longer being implemented, but it wouldn’t surprise me if it was still in effect. EB: Moving beyond the US, the Middle East has always been rife with human rights abuses, but the turmoil of the Arab Spring has intensified such abuses in many countries. While the dictatorships in Tunisia and Egypt were toppled without resorting to civil war, countries like Libya, Syria, and Yemen have seen heavy fighting. For America and NATO’s part, there has been yet another military intervention with the Libyan Civil War and only the stubbornness of Russia and China have prevented a similar ntervention in Syria. In both cases, rebel forces have asked, even begged, for American and European help in their war efforts, but have proven to be absolutely uninterested in negotiated settlements with their dictatorial adversaries, even when outside help is not forthcoming. What is your take on military interventions, both the intervention that did occur in Libya and the one that is being called for in Syria? Is it morally justifiable to send Texans and Louisianans into harm’s way to fight in the internal conflicts of Libyans and Syrians? Conversely, can refusing to intervene be justified when entire cities, such as Misrata, Benghazi, Aleppo, and Homs were or are being threatened with utter destruction and tens of thousands of civilians are being killed? NC: Well, let’s start with Syria. The one thing I disagree with in what you said is that I doubt very much that Russia and China had anything to do with the lack of US or Western military intervention in Syria. In fact my strong suspicion is that the United States, Britain, and France welcomed the Russian veto because that gave them a pretext not to do anything. Now they can say, “How can we do anything? The Russians and the Chinese have vetoed it!” In fact, if they wanted to intervene, they wouldn’t have cared one way or the other about a Russian or Chinese veto. That’s perfectly obvious from history, but they didn’t want to intervene and they don’t want to intervene now. The military and intelligence strategic command centers are just strongly opposed to it. Some oppose it for technical, military, reasons and others because they don’t see anyone they can support in their interests. They don’t particularly like Assad, although he was more or less conformed to US and Israeli interests, but they don’t like the opposition either, especially their Islamist elements, so they just prefer to stay on the side lines. It’s kind of interesting that Israel doesn’t do anything. They wouldn’t have to do much. Israel could easily obilize forces in the Golan Heights (Syrian territory that Israel illegally annexed). They could mobilize forces there, which are only about 40 miles from Damascus, which would compel Assad to send military forces to the border, drawing them away from areas where the rebels are operating. So that would be direct support for the rebels, but without firing a shot and without moving across the border. But there is no talk of it and I think what that indicates is that Israel, the United States, and their allies just don’t want to take moves that will undermine the regime, just out of self-interest. There is no humanitarian interest involved. As far as Libya is concerned, we have to be a little cautious, because there were two interventions in Libya. The first one was under the auspices of the United Nations. That’s UN Resolution 1973. That resolution called for a no-fly zone, a ceasefire, and the start of negotiations and diplomacy. EB: That was the intervention for which the justification was claimed to be the prevention of the destruction of Benghazi? NC: Well, we don’t know if Benghazi was going to be destroyed, but it was called to prevent a possible attack on Benghazi. You can debate how likely the attack was, but personally, I felt that was legitimate – to try to stop a possible atrocity. However, that intervention lasted about five minutes. Almost immediately, the NATO powers (France and Britain in the lead and the United States following) violated the resolution, radically, and became the air force of the rebels. Nothing in the resolution justified that. It did call for “all necessary steps” to protect civilians, but there’s a big difference between protecting civilians and being the air force for the rebels. Maybe we should have been in favor of the rebelling forces. That’s a separate question, but this was pretty clearly in violation of the resolution. It certainly wasn’t done for a lack of alternative options. Gaddafi offered a ceasefire. Whether he meant it or not, nobody knows, because it was at once rejected. Incidentally, this pact was strongly opposed by most of the world. There was virtually no support for it. The African Union (Libya is, after all, an African country) strongly opposed it, right away, called for a ceasefire, and even suggested the introduction of African Union forces to try and reduce the conflict. The BRICS countries, the most important of the developing countries, (Brazil, Russia, India, China, and South Africa) happened to be having a conference at the time and they strongly opposed the NATO intervention and called for moves towards diplomacy, negotiations, and a ceasefire. Egypt, next door, didn’t participate. Within NATO, Germany refused to participate. Italy refused too, in the beginning, though later they joined the intervention. Turkey held back. Later on they joined, but initially they opposed intervention. Generally speaking, it was almost unilateral. It was the traditional imperial powers (France, Britain, and the United States) which intervened. In fact it did lead to a humanitarian catastrophe. Maybe it would have happened anyway, but it certainly led to that, especially in the end with the attacks on BaniWalid and Sirte, the last pro-Gadaffi holdouts. They are the main center of Libya’s largest tribe, the Warfalla tribe. Libya is a highly divided tribal society, they are a major tribe, and this was their home center. Many of them were pretty bitter about that. Could it have been resolved through diplomacy and negotiations the way the African Union and BRICS countries suggested? We don’t know. It’s also worthy of note that the International Crisis Group, which is the main, non-state element that deals with continuing conflicts and crises throughout the world, and is very highly respected, opposed intervention too. They strongly supported negotiations and diplomacy. However, the African Union and others’ positions were barely reported on in the West. Who cares what they say? In fact, if they were reported on at all, they were disparaged on the grounds that these countries had had close relations with Gaddafi. In fact, they did, but so did Britain and the United States, right to the end. In any event, the intervention did take place and now one hopes for the best, but it’s not a very pretty picture. You can read an account of it in the current issue of the London Review of Books by Hugh Roberts, who was, at the time, the North African Director of the International Crisis Group and a specialist on the region. He opposed the intervention and described the outcome as pretty hopeless chaos that is undercutting the hopes for an eventual rise of a sort of sensible, democratic, nationalism. So that wasn’t very pretty, but what about the other countries? Well, the countries that are most significant to the United States and the West, generally, are the oil dictatorships and they remain very stable. There were efforts to try and join the Arab Spring, but they were crushed, very harshly, with not a word from the Western powers. Sometimes it was quite violent, as in eastern Saudi Arabia and in Bahrain, which were Shiite areas, mostly, but it resulted in at most a tap on the wrist by the Western Powers. They clearly wanted the oil dictatorships to remain. That’s the center of their power. In Tunisia, which had mostly French influence, the French supported the dictatorship until the very end. In fact, they were still supporting it after demonstrations were sweeping the country. Finally, at the last second, they conceded that their favorite dictator had to go. In Egypt, where the United States and Britain were the main influences, it was the same. Obama supported the dictator Mubarak until virtually the last minute – until the army turned against him. It became impossible to support him anymore so they urged him to leave and make a transition to a similar system. All of that is quite routine. That’s the standard operating procedure for dealing with a situation where your favorite dictator is getting into trouble. There is case after case like that. What you do in that case is support the dictator to the very end, regardless of how vicious and bloody the he is. Then when it becomes impossible, say because the army or the business classes have turned against him, then ease him out somewhere, (sometimes with half the government’s treasury in his pocket) declare your love for democracy, and try to restore the old system. That’s pretty much what’s happening in Egypt.